For several weeks now I’ve been lamenting the lack of good quality new album releases. I blamed the Olympics, mostly because I didn’t want to believe the blandness of commercial radio and ITunes had driven a stake through the heart of creativity. 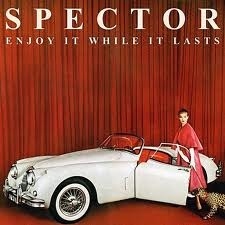 Then along came Spector’s ‘Enjoy it while it lasts‘. There’s been a sense of expectation surrounding this five-piece from East London, ever since the BBC named them as one of the Sounds of 2012 artists. Along with that expectation there was the predictable clamor of those who wished failure. What made it easier for the unsupportive was the apparent cockiness of Spector frontman, Fred Macpherson. But it seems that cockiness was well placed. ‘Enjoy it while it lasts’ brings nothing new to the music table, but it brings energy, rousing choruses and great riffs. And what else do I like? Well I listened to this entire album and heard every single lyric that passed Macpherson’s lips. I can’t tell you how wonderful it is to actually listen to a storyteller. Macpherson’s main fare is love lost, love found, love tried again.